The man with the green truck didn’t talk about the truck much. It was obedient, functional, and didn’t deserve much conversation, unless it was acting up. 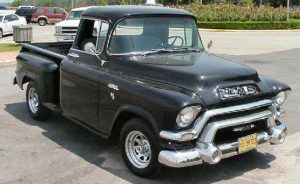 True, sometimes it wouldn’t start, but that was a problem most vehicles from the 50’s and 60’s experienced (carburetion improvements were yet to come). The bench seat wasn’t comfortable, but not terribly uncomfortable. By the standards of my future commutes (think San Diego to Canoga Park, Leucadia to National City, Port Washington to Stamford, Santee to Point Loma) it was ridiculously short (3 miles), even walkable. Maybe nine minutes; more when we had to pause to defrost the windows in January. If there was a radio, it’s been forgotten. Most radios were AM only and tended be unreliable. The hand-cranked windows didn’t seal very well, and rain would ooze down the inside of the windows. 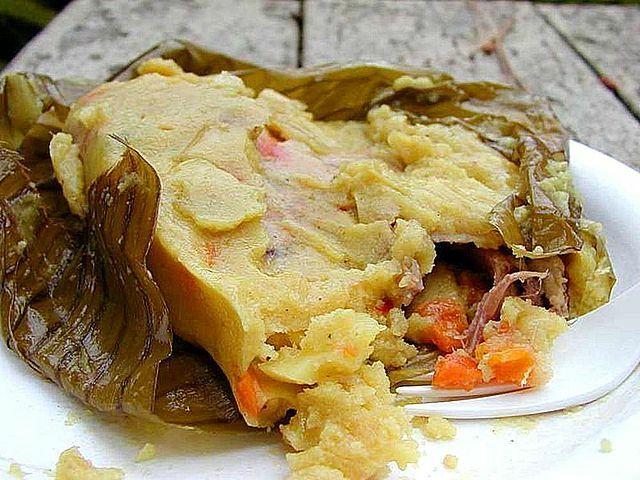 There may have been a defrost feature, but it didn’t work very well. Best you brought a cloth to remove the moisture so you could see out. Not only was there no air conditioning, but I don’t remember a fan, either. Or perhaps it just didn’t work well. The heater wasn’t too bad, but it didn’t do much after drop-off time. If there was an interior dome light, it certainly wasn’t tied to an opening door. Unlike our VW Microbus, it did have a fuel gauge. Seatbelts? Airbags? You’re kidding, right? Sometimes the doors would close the first time. I didn’t ride with him to school every day. Sometimes I carpooled with a friend’s Dad in his VW Beetle, or another adult (typically Mom) drive. What I took for granted at the time his readiness and steadiness. Taking my children to school or day care entailed a more of a battle: first, getting myself ready, getting them ready. Being late wasn’t a steady problem, but it happened often enough. This model was used. It had been an appliance dealer’s delivery vehicle, and the logo was still visible through the secondary paint job. On weekends or (his) vacation days, the truck served workhorse duty carrying this or that product: lumber, or trash runs to the dump. 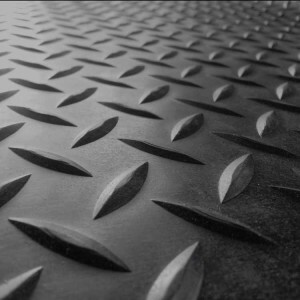 Imagine how hot that metal liner got during the Tucson summer. You’d want gloves to touch the liner — never mind somehow sit down in the back keeping the load from flying out onto the asphalt. What did he do with his vacation days? We didn’t have the usual outings, yet he probably got three weeks of vacation. What did he think about during those silent trips? Did he worry about what was going to happen at work that day? Was he fretting over what might have been seen as a fraying marriage, her sharp words reaching their intended target? In retrospect, during that phase of his life, fifteen years into marriage with six kids and a one-employer career with a large utility, his commutes were about duty. What could one say about duty? We didn’t talk about breakfast, or favorite foods, pick up a latte at Starbucks, crank the stereo, plan upcoming holidays, or even discuss politics. Or perhaps we did discuss something, but in the tunnel vision of adolescence, I listened with only half an ear. Of course, the experience of siblings probably varies from this. Their mileage may vary. These memories about the man with the green truck are demonstrably imperfect. Yet this caveat, four decades later, hardly dulls the desire to remember. There are only the unasked questions of an imperfect questioner. They swirl like still-unsettled ashes. Don Underwood valued healthy skepticism almost as much as the unquestioned value of hard work. Though he was a World War 2 veteran, he was skeptical about leaders who were certain that a particular war could be well-planned — or was just. Without ever saying so exactly, he fit the profile of the unglamorous peacemakers’ temperament: slow to anger and dubious about easy answers pro or con. In response to war rhetoric he wasn’t so much pacifist but skeptical, with a Will Rodgers take on statesmanship. He was a debater in high school, but in later years he was more likely to suggest you go think it over more than than to refute opinions outright. The big deals of the Big Dealers rarely go as planned, he reasoned, so you’d best be prepared. And that went for the war planners who, he once told me, never had to fly strafing missions so close that you could see who you were killing. The more certain others were of the sureness of their path, the greater the need for skepticism. That instinct for contemplation is rather a big deal. ►Factoid: 93% of young Iraqis regard the United States as their enemy, according to one survey in 2016. DRU was a big Chet Atkins fan, but this then-LP probably got more play from his oldest son, who had to get his own copy soon enough. According to the Wikipedia page on the album, it the studio was pretty bare by today’s standards, but the results speak for themselves. 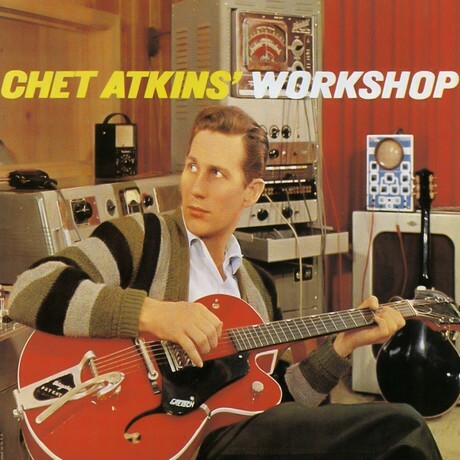 There is a review on AllMusic, which reports that this was Atkins’ best-selling album. The YouTube playlist linked to here may not remain up for long, so apologies in advance, but give this a try. You can purchase the CD on Amazon. DRU owned a guitar, but AFAIK he only played prior to the move to Edgemont. On the other hand, both Mark and Ross were struck by the bug. Wikipedia advises that, over the course of a highly productive recording career, this album was his best-seller. I am biased, but as one who owns perhaps half a dozen of his other albums, I must agree. I first heard this as a child (hence the sentimentality warning), but after being reminded of this album by a blog post, I sought out the CD on Amazon, and, while I don’t use the term lightly, I’m overjoyed. Sure, the album has a “country” feel to its arrangements, drum parts bends, and to a lesser extent, the song choice. But the playing sounds so effortless, the delay, tremelo and reverb effects in this pre-electronics era are light years ahead of their time (obviously he educated himself by studying Les Paul closely). “Goofus,” and “Whispering” own their country roots, while “Lambeth Walk,” and “Theme from ‘A Summer Place” reach for a broader audience. If electric guitar timbre is as important to your listening pleasure as the notes, the combination of good song selection, playing and recording excellence will not disappoint. The Gretsch (assuming it’s used throughout) shows its variety across high, low and midrange, In “Tammy,” you’ll hear it put to full, grinning, use. Thanks for buying that record, I’d say to my late Dad (but I don’t recommend vinyl!). Once he became an empty-nester, DRU resumed a fascination with cars from his pre-family days. Gone were the pragmatic VW Microbus (’56 and ’60) and GMC truck. and a succession of vehicles began that perhaps Kris can recite for us. 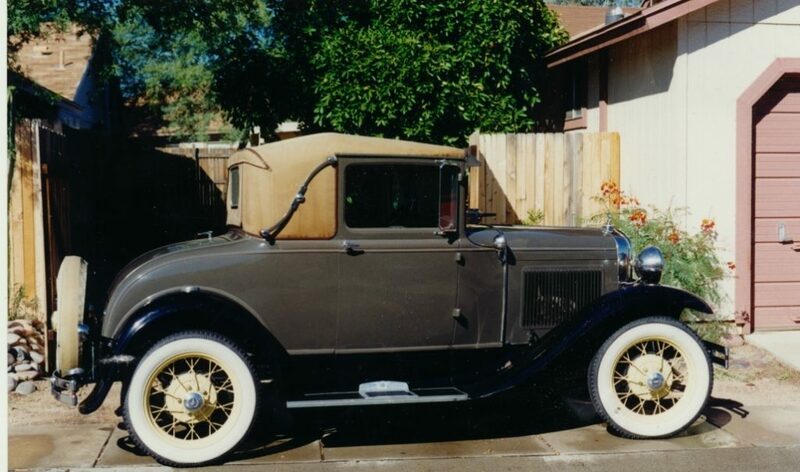 Most notable among these was his Ford 1930 Model A, which he worked to restore in the late 90’s and beyond. Training photo: 838th Bombardment Squadron, Heavy, 1943. Allan Underwood in top row, 4th from left. 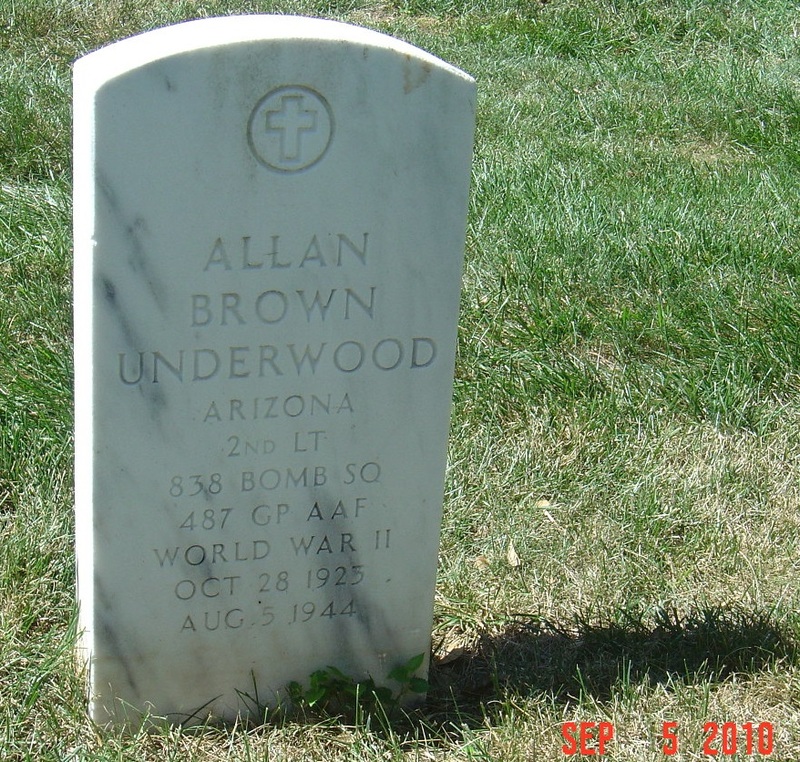 Despite reservations about the military-industrial complex, and the disproportionate weight given to war storytelling, the story of Allan Underwood is worth telling. The details are provided by a web site for the 487th Bomb Group, which as of this writing is still holding reunions. As the site explains, the toll on U.S. airmen was considerable; the air battles cost 26,000 lives and 18,000- wounded — 10% of all U.S. deaths in the war. 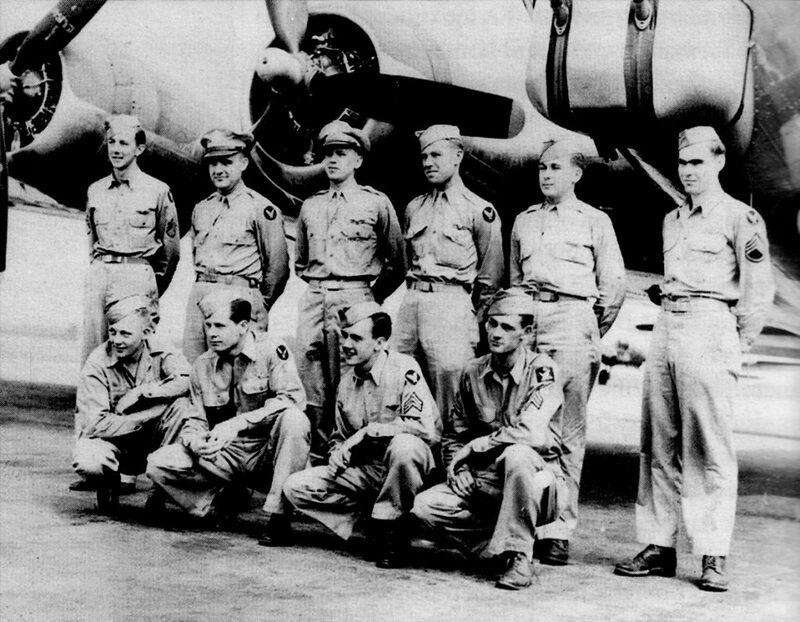 This group flew B-24H/J and B17G aircraft, and it lost 33 aircraft. Its bases of operation were farflung, including locations in Nebraska, New Mexico, Florida and New Jersey. In Europe, the base was Station 137 in Lavenham, Suffolk, England. Allan’s experience would have been highly compressed. The group’s first combat mission was not flown until its control was transferred to England’s Eighth Air Force. That event took place in 7 May 1944. Missions flown were not limited to Germany. For instance, the group flew numerous missions to attack V-weapon installations in France, marshalling points in Belgium and airfields in Holland. 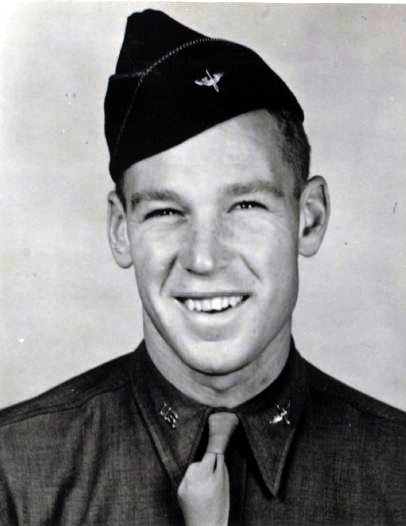 After training, he was assigned as navigator on the heavy bomber crew of Second Lieutenant Charlton A. Deuschle, in the 838th Bomb Squadron of the 487th Bomb Group. 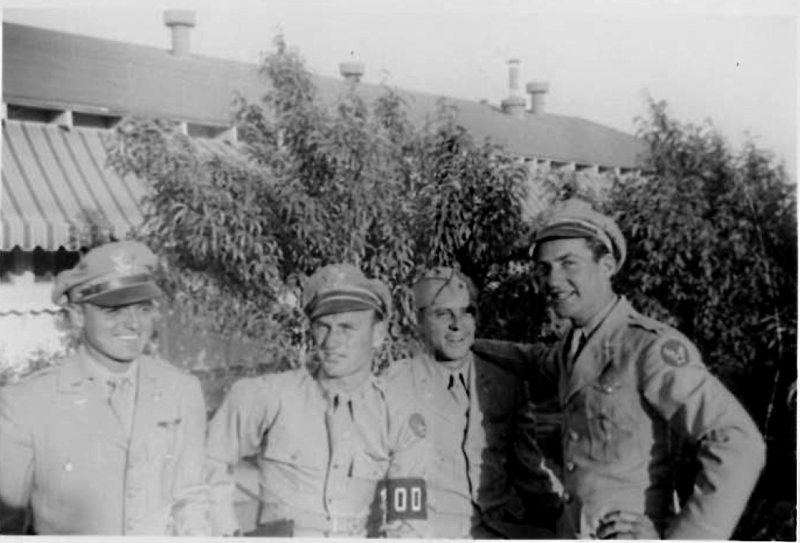 This Group was based at Army Air Forces Station 137, near the village of Lavenham, Suffolk, England, and was part of the 8th U.S. Army Air Force in Europe. Lt. Underwood and seven of his crew mates were killed in action on 5 August 1944 while on a mission to bomb an aircraft factory at Magdeburg, Germany. Their aircraft, B-17G 43-38007 [which the crew dubbed “The Moldy Fig”], was shot down by flak during the bomb run, and crashed near Lostau, Germany, 13 kilometers southwest of Burg, Germany, just northeast of Magdeburg. Pilot Lt Deuschle and gunner Sgt Robert J. Crooker survived and became prisoners of war. The dead were buried initially at the village cemetery in Lostau. (Lostau is a village and a former municipality in the Jerichower Land district, in Saxony-Anhalt, Germany. Since 1 Jan 2010, it is part of the municipality Möser). After the war, Underwood’s remains were returned to the United States and re-interred at Arlington National Cemetery in Arlington, Virginia. He is buried in Section 11, Site 253 LH. There are a few other details. Survivor Sgt Crooker, who told relatives that he was “severely mistreated by German civilians” while he served as a POW, reported that their B-17G took a direct flak hit on the right wing and in its bomb bay 1-2 minutes before the start of the bombing run. Part of the wing came off and the aircraft exploded, all in a matter of seconds. German civilian losses from Eighth Air Force strategic bombing, while not associated with this particular mission, were at times consequential. For instance, a raid two months later on Duisburg, about 250 miles from the crash site, caused a firestorm and killed 2,500. Duisburg was a logistics center for the Nazis and a center for chemical, steel and iron industry at the time. The war stories from Bill, John and Robert have not been a major part of family lore — at least not so far. From what has been determined so far, the Underwood boys were loyal, disciplined and answered a calling that — as wartime callings go — had a moral high ground. 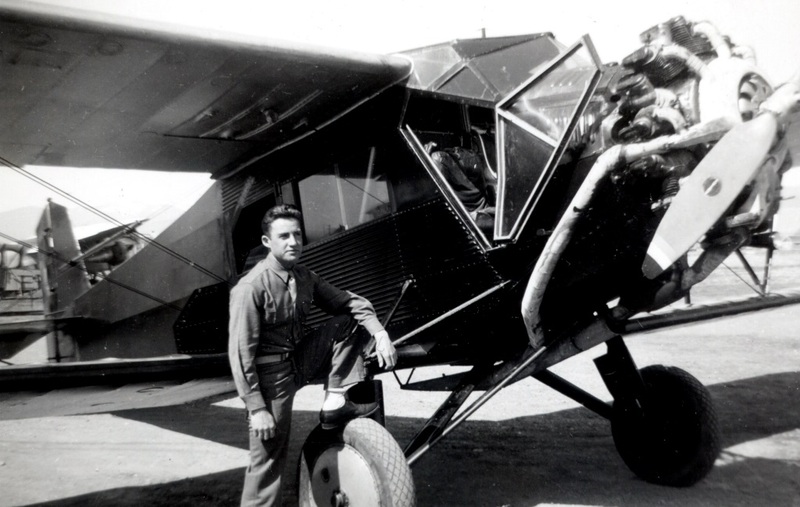 DRU was stationed in Missoula Montana for pilot training before shipping out to the Pacific front, where he served as a B-25 pilot in the Philippines. 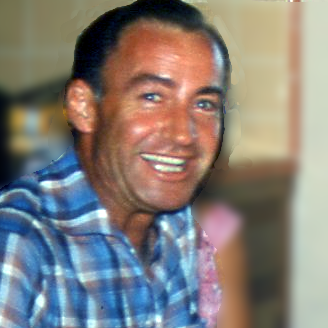 Don Robert Underwood, 82, died peacefully at home April 19, 2005. Born August 8, 1922 in Nogales, Arizona to Timothy Irve and Ellen Christine. He is survived by his children Mark, Kris, Cele, Page, Beth, Ross and their mother, Billie Jeanne, and six grandchildren. He is also survived by brothers John, William, Gerald, three nieces and two nephews. His brother, Allan Underwood, preceded him. 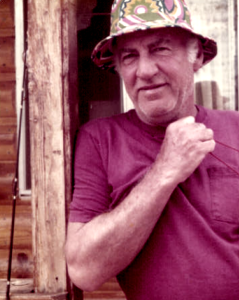 He retired after 42 years from “the telephone company” (Mountain Bell) where he developed lifetime friendships, especially Hal Cunningham, Jon Smith, and Wally Macafee (Glenda). Services are private. Memorial donations can be made in his name to your favorite charity. 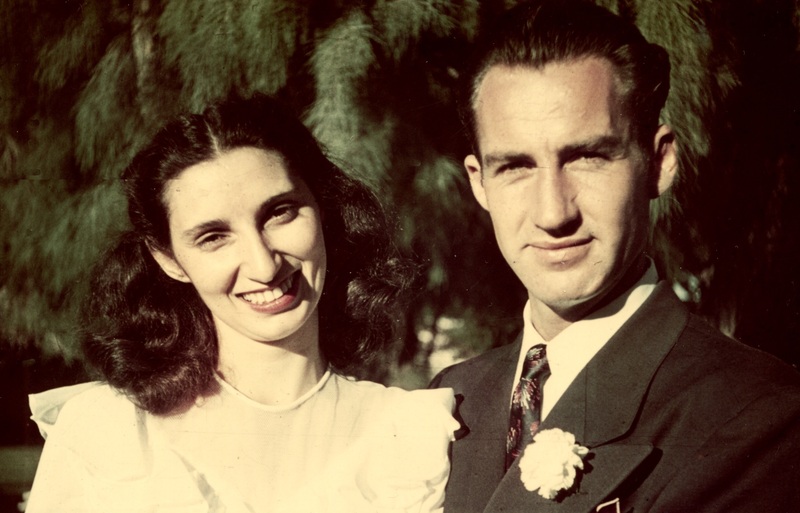 Don Robert Underwood married Billie Jeanne Allen (her web site) in Tucson in 1948.